Pick-n-Pull's Cash For Junk Cars program buys unwanted vehicles so that the general public can make a few bucks while cleaning up their yards, driveways and garages. Unlike other programs, Cash For Junk Cars welcomes all makes and models of vehicles, domestic and foreign, running or not. We offer some of the highest prices paid for your vehicles. Pick-n-Pull's Cash For Junk Cars program buys vehicles online, by phone and at Pick-n-Pull stores in the U.S. and Canada. How It Works – 4 EASY Steps! Submit your vehicle info online or over the phone and receive a quote instantly! Accept our offer and we will collect additional information needed to complete the process. 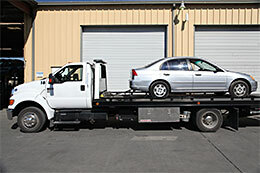 We will tow your vehicle for free if it is in our local towing zone. Or, you can drop off the vehicle at your nearby Pick-n-Pull store. After we receive your vehicle, you will receive payment. Why Should I Sell My Vehicle to Pick-n-Pull? The San Francisco Bay Area Air Quality Management District pays $1,000 for 1994 and older vehicles that are operating and registered in certain Bay Area zip codes. Please see this web page or contact 800-727-2708 for details.